On Friday (not your standard Sunday/Monday), 5 Seconds of Summer released the first single from their second album, which went straight to the top of the iTunes charts all around the world. And it's really not the sort of song you'd expect from the title, She's Kinda Hot. And I think I like it more because of that. When the title was initially confirmed, it seemed sort of like they were doing a newer version of their debut single, She Looks So Perfect, as both names sound pretty similar. However, upon hearing the song, it's far more punk than it is pop, despite the band's mainstream success. I really like that they've managed to make punk more popular, and I think people seem to overlook that a lot just because of the band's past association with One Direction. The song isn't what you'd expect, sure. But as a band, more so, I think 5 Seconds of Summer really aren't what you'd expect (which in itself is pretty darn punk). 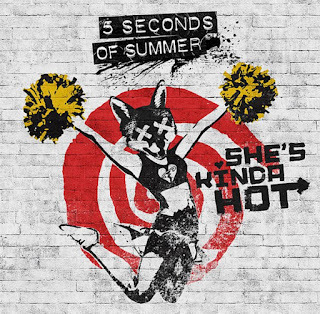 She's Kinda Hot is far more about doing whatever the hell you want than it is about some hot girl. I love the line 'they say we're losers and we're alright with that'; I feel like a lot of people who listen to the song will like that line in particular. Because when a globally known band are alright being losers, I guess you find it easier to accept what other people say about you, and you start to care less about what they say and care more about what you want to do, as the band are. 'We're alright though' is literally saying what someone says about you doesn't bother you because you know who you are far better than they do. This is a song about being called a loser, and maybe even feeling like one, but rising above the identity that other people are attempting to force you into. It's about strength and nonconformity, and we all love a bit of that. The instrumentation is brilliant. Initially the song seemed a little slow, but the tempo works well overall, especially when the timbre really comes through and the guitars get louder, the layers of sound all build up and balance everything out. There's an awesome guitar solo in the middle of the song, which is probably my favourite part of the whole thing (the sarcastic backing vocals that are added in here and there are really great too (really into the tone)). The overall sound actually reminds me a lot of My Chemical Romance's Teenagers. 'We are the kings and the queens of the new broken scene' is another great line. It's about paving your own way, doing your own thing, and doing it however you want to. This is the line that's stuck with me most in the song, and it's the line that tells me the next album is heading even further in the direction I thought their first album would send them in. I really liked Social Casualty on their debut album, and Rejects from one of the band's EPs, and I'm glad that sound and those kinds of themes are pulling through. I'm looking forward to the album.